The Best Cheap Bass Guitars in 2019: Reviewed and Rated! Looking for the best cheap bass guitar you can jam with or give to a kid? You’ve come to the right place. 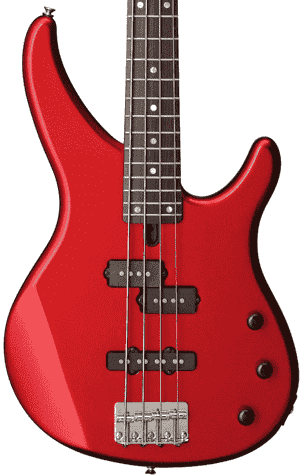 On this page you’ll see carefully selected bass guitar models that are easy on the wallet yet deliver on quality. Yes, these are some of the best bass guitars you can get for cheap, but they don’t look and feel cheap at all. Most importantly, they are by no means cheap-sounding. We’ve chosen these bass guitars based on build, sound quality, value for money and their overall performance so you can feel confident of your purchase. Let’s go! Ibanez GSR200 Electric Bass Guitar The Ibanez GSR200 delivers an impressive performance at a very pocket-friendly price. It’s a great bass for beginners, intermediate players and even professionals who want an easy-to-play instrument that doesn’t sound cheap. The GSR200 features a Powersound P and Powersound J pickup configuration, an agathis body and a thin, fast neck made of maple and topped with a rosewood fretboard. Squier Vintage Modified Jaguar Electric Bass Guitar Can’t afford a Fender Jaguar? Why don’t you go for the Squier Vintage Modified Jaguar instead? It’s got the same Fender Jaguar looks with modern upgrades such as a C-shaped neck profile. The Vintage Modified Jaguar Bass Special by Squier features a basswood body and the versatile “PJ” pickup configuration, with a P-Bass middle pickup and a J-Bass bridge pickup. Ibanez TMB100 Electric Bass Guitar The Ibanez TMB100 Talman Electric Bass is another fantastic instrument you can get for cheap. This bass guitar sports a cool-looking retro Ibanez body shape. It’s got a warm-sounding mahogany body coupled with a maple neck and rosewood fretboard. The Ibanez TMB100 is fitted with versatile Ibanez DXP and DXJ pickups for a wide variety of rich, classic tones. Ibanez SR300E Electric Bass Guitar Ibanez guitars are really worth so much more than their price. The Ibanez SR300E is a bass model that won’t let you down, whether you’re doing your first gig or going on your first tour. The SR300E bass sports a mahogany body, a five-piece maple/rosewood neck, a jatoba fingerboard and PowerSpan Dual Coil pickups at the neck and bridge. Yamaha TRBX174 Electric Bass Guitar The Yamaha TRBX174 is a force to be reckoned with, despite its low price. It’s got an agathis body, a five-piece maple/mahogany neck with a sonokeling fingerboard, a vintage-style bridge and a P/J pickup configuration (split-coil/single-coil) that offers an impressive range of bass tones. The Yamaha TRBX174 is definitely one of the best cheap bass guitars today. Rogue LX205B Electric Bass Guitar If you’re looking for a cheap 5-string bass guitar, consider the Rogue LX205B. This model offers exceptional quality for its price of under $200. The LX205B has a basswood body and an extended maple neck topped with a rosewood fingerboard. It also features covered traditional J-style pickups as well as two pairs of tone and volume controls. Ibanez introduced its Soundgear or SR series of electric basses in 1987, with the objective of offering a thin, smooth and fast-playing professional-grade instrument that musicians can count on for playability, durability and comfort. 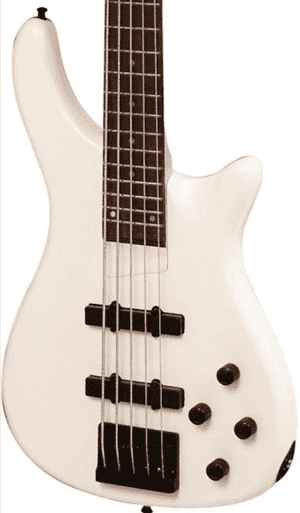 The GSR or Gio Soundgear line includes the budget versions of the standard Soundgear basses and as such are known to be entry-level models. 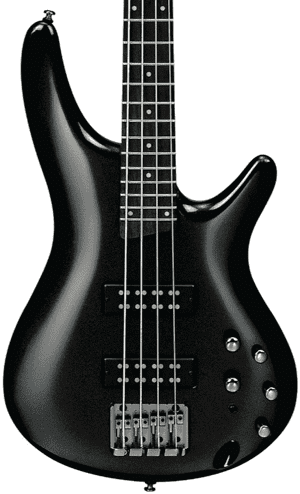 Nonetheless, the bass guitars in the GSR line, such as the Ibanez GSR200, have the same sleekness, tone, playability and sleekness characteristic of Soundgear basses. Their performance exceeds what one can expect from a sub-$200 bass guitar, making the GSR200 one of the best cheap bass guitar models in the world. The Ibanez GSR200 sports a GSR4 agathis body and a resonant maple neck. It also has a smooth 22-fret rosewood fingerboard with pearl dot inlays. The agathis body contributes to a warm tone with a good presence in the lows and mids. The Ibanez GSR200 electric bass guitar is equipped with a Powersound P neck pickup and a Powersound J bridge pickup, capturing the rumbles and resonance from your guitar clearly. Tone needs a bit of tweaking? Shape it via the volume, tone, EQ and PHAT-II bass boost controls! Squier guitars are Fender guitars made more affordable by the use of alternative woods and hardware. 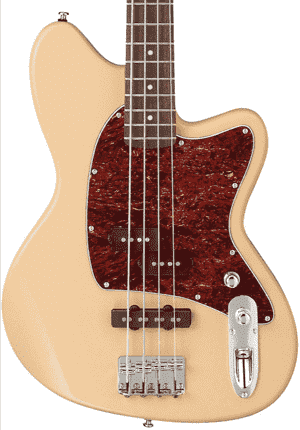 If your wallet just can’t accommodate purchasing a Fender Jaguar bass, you can choose the Vintage Modified Jaguar Bass Special with the confidence that you’ll be getting a quality instrument, even if it’s priced a lot cheaper than the Fender model. The Vintage Modified Jaguar Bass Special by Squier features a basswood body that delivers a balanced resonance and focus across the frequency range. It has an ultra-slim bolt-on maple neck with a comfortable C-shaped profile, allowing you to play for hours without getting fatigued easily. The rosewood fingerboard with 20 medium jumbo frets is smooth and easy to play, especially for beginners. Capturing the sounds from the bass clearly and seamlessly is a PJ pickup configuration. At the middle position you’ll find a split single-coil Precision Bass pickup and at the bridge you’ll see a single-coil Jazz Bass pickup. The pickups do their job well, guaranteeing a tone that doesn’t sound dull or muddy. Each pickup has its own volume control, and you get one master tone control as well as an active bass boost control for more low-end power. 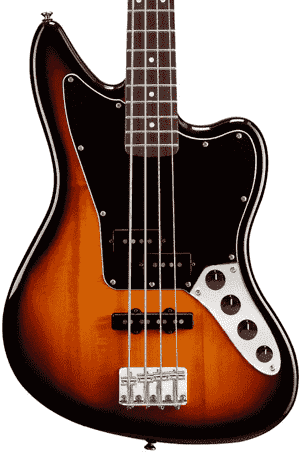 The Ibanez TMB100, part of the Talman bass series, has a classic look, vibe, feel and sound. The Talman body shape was introduced in Ibanez electric guitars in 1994, then on acoustic guitars and electric basses. Costing just below $200, the Ibanez TMB100 is a tough contender in the arena of cheap bass guitars that don’t sound and feel cheap. The TMB100 has a mahogany body and a gloss-finished TMB4 maple neck with a 20-fret rosewood fingerboard. The mahogany body delivers that much-desired warm and punchy tone. The smooth neck feels like that of a traditional jazz-style bass. The lower cutaway gives players ample access to the upper frets. Capturing the sound coming from the bass is a set of Dynamix pickups – a DXP pickup at the neck and a DXJ pickup at the bridge. The bass also has a custom 2-band active EQ, and there are stackable controls for bass/treble and volume/balance. Plugged in, the Ibanez TMB100 delivers a warm, rounded tone that can be easily tweaked via the bass and treble EQ. The controls are simple and intuitive, making it easy to shape the tone of the bass. If you’ve got a little more cash to spare but don’t want to spend more than $400 on a bass guitar, the Ibanez SR300E would sit comfortably within your budget and you’ll still have money for accessories like a new guitar strap and new strings. Part of the popular Soundgear series, the Ibanez SR300E bass has the core features characteristic of the SR line: a lightweight body with a smooth and fast neck, plus an electronic system that matches the guitar perfectly. The Ibanez SR300E has a mahogany body and a five-piece SR4 maple/walnut neck. The SR neck is well-known for its easy-to-play slim profile. The five-piece maple and walnut construction provides strength and stability while also enhancing sustain. At the neck and bridge you’ll find PowerSpan Dual Coil pickups, whose exposed pole pieces produce a stronger signal and an increased higher-frequency response without compromising low-end frequency response. The result? A powerful bass tone that’s not only rich in harmonic detail but also in dynamic expression. The SR300E comes with Ibanez custom electronics. The 3-band EQ works seamlessly with a three-way coil tap switch so you can choose from Tap, Series and Power Tap Modes. The pocket-friendly price of the Yamaha TRBX174 makes it most suited for beginners on a budget, but even advanced and professional players would enjoy having it in their collection. This no-frills bass guitar is able to deliver a solid performance no matter the occasion – whether it’s daily practice or gigs. The Yamaha TRBX174 has a body that’s made from either agathis or alder. The body features a mass-optimized design to distribute weight evenly and provide an optimum balance between comfort and tone. This means that the bass doesn’t only sound good, it feels great as well. It’s not too heavy that your back will start to hurt an hour after you start playing. The neck is made of maple/mahogany and it’s topped with a sonokeling fingerboard. The neck has a fast and extremely comfortable profile. The five-piece construction adds to the guitar’s overall stability. The Yamaha TRBX174 has a vintage-style bridge with four adjustable saddles. This bass has a P/J (split-coil/single-coil) pickup arrangement for optimum tonal flexibility. The YGD-designed H5 pickups feature a quad-pole piece design and have a volume knob each. Simple and straightforward. This bass guitar is nothing fancy, but it’s surely something you’ll fancy! The Rogue LX205B makes it easy to get started on the bass. For a cheap price under $200, you get a well-built 5-string bass that not only is easy to play but also sounds like a more expensive instrument. Rogue guitars are fairly new to the business, having only been introduced in the mid-1990s. The instruments are beginner budget-friendly but are solidly constructed, guaranteeing you’ll have a guitar you can rely on and enjoy for many years. The Rogue LX205B is one such guitar. This electric bass features a basswood body with a dual cutaway, a bolt-on maple neck and a rosewood fingerboard with 24 frets. It also has a high-mass saddle bridge that can be easily adjusted as well as split and single-coil J-style pickups. The pickups are covered in a traditional style and deliver a strong and clear tone. There are two controls for tone and two for volume, allowing you to shape your sound as you please. 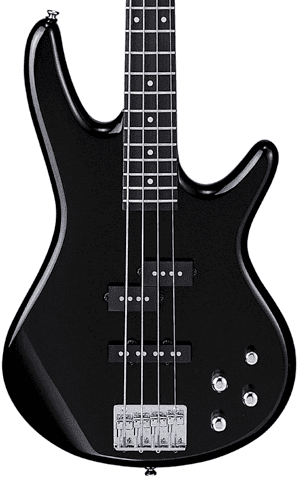 The Rogue LX205B 5-String Series III bass looks very simple, but the black hardware does provide a nice contrast. The die-cast tuners keep the tuning stable so you won’t have to worry about going out of tune while playing. Why should you buy a cheap bass guitar? There are so many bass guitars out there, why would you settle for a cheap model? Good question! Different people may have different answers, but ours would be: Why not? Indeed there are lots of excellent basses in the market, but unfortunately not all of them are accessible to many players price-wise. If you have the resources to buy a high-end bass guitar, by all means do so. If you don’t, there’s no need to let go of your dreams of playing bass. As we’ve shown in our list, there are plenty of bass guitar models that are cheap in terms of cost, but not in performance. Buying a cheap bass guitar doesn’t mean settling for a low-quality instrument, it simply means making a wise purchase that’s within one’s means. So why should you buy a cheap bass guitar? Because it lets you play without having to spend a lot, that’s why! Of course, it’s recommended to make sure that the bass you’re buying doesn’t sound dull or muddy and isn’t going to disintegrate after only a few months of use. The basses we’ve listed above have been tried and tested to withstand normal playing conditions so you can be sure to have a steady and great-sounding instrument. Who should buy a cheap bass guitar? Anyone with a budget of $400 can buy a cheap but good bass guitar. It’s important to note that bass guitar models at this price tier are mostly designed for beginners, so they’re as basic as can be. No expensive finishes, no gold hardware, no exclusively designed pickups, no abalone inlays, no grade-A wood. But for beginners, that’s absolutely fine as long as everything works. Basswood, dot inlays, a gloss finish, generic tuning machines and standard pickups will certainly do – what’s important is the bass is easy to play and produces a sound that motivates you to keep going. But cheap bass guitars aren’t just for beginners. They’re also great for advanced players looking for a practice instrument they can leave in their living room, gigging musicians looking for a backup bass and even professionals who like modifying bass guitars. This is what’s great about cheap basses: you can swap out parts and experiment with different combinations of pickups, tuners and other components so you can come up with a particular sound that suits your taste. How can you improve the sound of a cheap bass guitar? The materials used and even the manufacturing process affect how a guitar sounds. This is true for all kinds of guitars. Understandably, guitars that are priced lower than others would be made from less expensive materials. They sound good, but not as good as pro-grade instruments. With that said, how can you improve how a cheap bass guitar sounds? It may already sound decent, but what if you’re looking for more in your guitar? For beginners, one of the easiest things you can do is to change the strings. A cheap bass can instantly sound like a more expensive one with a quick string change. You can also try changing the tuners along with the strings. A proper setup is recommended so you can be sure the guitar would play and sound its best. Other modifications such as pickup upgrades are more for experienced players, but if you’d like to give it a go, make sure you know what you’re doing! How can you make a cheap bass guitar last longer? Proper care and maintenance go a long way in making sure your cheap bass guitar stays with you for many years. A guitar, no matter the cost, is still an investment you need to protect, so make sure you give your bass the care it needs to keep it in good condition. Here are some maintenance tips to follow. ● Wipe it regularly with a soft cloth especially after playing. ● Clean the strings as well so that gunk from your fingers won’t accumulate and dull the sound. ● Use only mild cleaners that are specially formulated for guitars so you don’t damage the finish. ● Change the strings every few months or weeks depending on how often you play. ● Keep the bass in a sturdy case when you’re not playing it. Lastly, if something seems broken and you have no idea how to fix it, don’t hesitate to consult a pro. A guitar technician would know what to check in your guitar and how to address the problem. Taking your bass to a guitar tech for a checkup and setup every now and then is the surest way to extend the lifespan of a cheap bass. It also saves you from having to spend on costly repairs in the future.